Icebreakers are working overtime to clear a path for vessels that carry items like heating oil. >>> from the great lakes to the atlantic shores and all the water ways in between, it is an effect of one of the coldest januarys on record, ice jams, that make for some spectacular winter scenery, but as our kristen dahlgren reports they are causing some serious problems on the water ways in the world. >> reporter: on this coast guard cutter , this is one objective. >> we want to keep this channel clear so that maritime traffic can get through. >> reporter: these are not the icy waters of antarctica, these are the icy waters of philadelphia. >> it has been at least 20 years since we saw it this bad. >> reporter: so every day, the coast guard ice breakers are out, fighting to make sure the vital lanes stay open. >> it is necessary for the heating oil and groceries, all coming through the maritime channels, so if the river froze through, obviously, that affects thousands of people. >> reporter: this year, the extreme cold left hundreds of waterways iced over. in the hudson river it is almost a constant battle. overhead, reconnaissance scouts for ice jams, while down below crews attempt to cut through. >> people don't realize if we're not out here these areas will not flow through new york, it just won't happen. 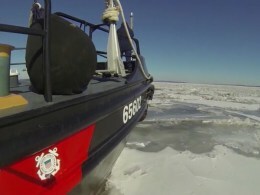 >> reporter: on the great lakes, ice breakers are running day and night to keep things moving. when temperatures are at their coldest, the lakes freeze over as soon as the boats pass. meanwhile, back on the delaware, a dead end . >> this is about as far as we can go today. the ice here simply is too thick to get through. so their best bet is to break up the ice south of here so once it does freeze it will have someplace else to go. >> if it jams up there is a risk of flooding along the banks of the river up there. >> we're trying to make a dent in it and doing the best we can. >> reporter: to keep the waters flowing during an extraordinary winter that is far from over. kristen dahlgren, nbc news, philadelphia.